“Over 10 years ago (2009), I came to Detail King for the 2 Day Technician Program. The 2 Day Class provided me with everything I needed to jump start my business and keep it moving in the right direction. I believe Detail King provides the most comprehensive hands on auto detailing program anywhere. It is an ABSOLUTE MUST for all beginners and experienced detailers. The first day of the class I asked the owner Nick Vacco if he was willing to provide ongoing technical and marketing support. His answer? “ABSOLUTELY! It is our job to help you succeed so in turn Detail King succeeds.” I took Nick at his word and that day I became an Authorized Detail King Licensee and Bill Bruno became my DK Representative. What I wanted from Detail King was what I call “one stop shopping”. Make one call to find the answer about a products, a piece of equipment, detailing methods, or anything about marketing. I did not want to spend half my life talking to companies, people and spending endless hours on the internet hunting for answers. In the past 10+ years Nick, Bill, and the entire Detail King team have NEVER let me down. They have ALWAYS been there when I needed them. Not many businesses could afford to pay for that kind of support. If you have not tried Detail King you need to do so now. You have nothing to lose and everything to gain. Jim Boucher – Detail King Really Does Change Lives! 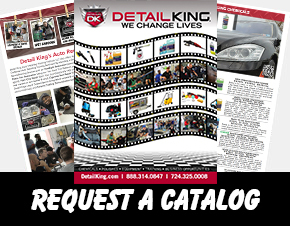 Auto Detailing Business Tips Newsletters – Thank You! Auto Detailing Procedure Banners for Your Shop! Detail King Certified Auto Detailer! Detail King’s Secret Sale! 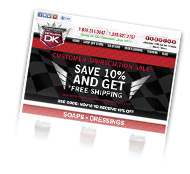 – *20% Off Most DK Products! Minimum Order $49! GET THE DETAIL KING GO APP HERE! WE CHANGE LIVES – Contest! Eco-friendly Mobile Auto Detailing Business.